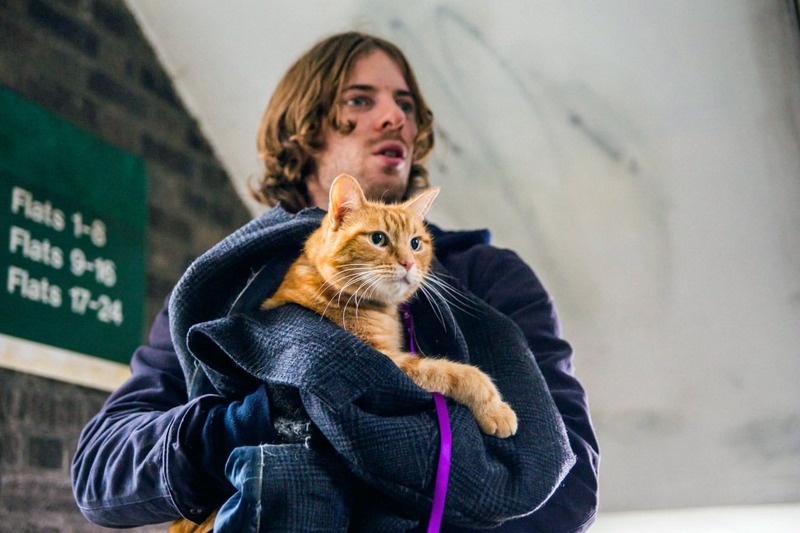 A down on his luck busker who’s also a former drug addict, finds his life transformed when he’s befriended by a ginger cat. This heart-warming true story follows the story of James Bowen, a guys initially living on the streets, scraping together money by performing with his guitar who has also been disowned by his father (Anthony Head) but finds solace in a mysterious cat who helps people see the good in him … including a neighbourhood girl (Ruta Gedmintas). I loved how this movie played out. Initially you’re watching the fly-on-the-wall story of this guy, a recovering drug addict, no-hoper who has a bit of a talent for busking. However the inclusion of the cat, a lovely ginger tom could have tuned this into a cheese-fest but is handled well, including clever ‘from-the-cat’s-viewpoint’ perspectives that help to communicate the bond that is formed. However this doesn’t sugar-coat the harsh reality of homelessness or drug addiction either, despite never getting all that hard-hitting. Therefore this is generally a feel-good journey and performances across the board are solid, especially an easy to like Luke Treadaway as James who’s plight thoroughly grabbed me. I also should add this brought a tear to my eye towards the end, and is filled with many charming and touching moments that really hit home. It’s the sort of movie that also makes you think differently and open your eyes. When you consider that all this happened as well, it’s quite remarkable and made me believe that in some shape or form, there’s a guardian angel out there for all of us. If you haven’t guessed by now, I really enjoyed this probably more than expected. This entry was posted in Comedy Reviews, Drama Reviews, Movies, Reviews, World Cinema and tagged A Street Cat Names Bob, Anthony Head, Bob the cat, busking, drug addiction, homeless, James Bowen, Joanne Froggatt, Luke Treadaway, Roger Spottiswoode, Ruta Gedmintas by Craig M. Bookmark the permalink.